In a media event on March 25, 2019, President Trump issued a presidential proclamation officially recognizing the Golan Heights as Israeli territory. This act formalizes a new policy that Trump had announced by tweet in the prior week. The White House signing, with Israeli Prime Minister Benjamin Netanyahu looking on, followed a joint press conference from the two friendly leaders. 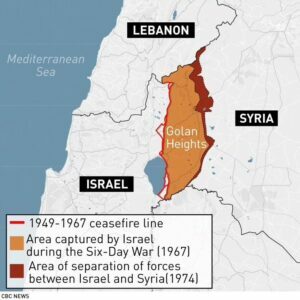 Israel has now held the Golan Heights territory for 52 years, ever since it was captured in the 1967 war. And then also decades ago, Israel had de facto annexed the territory, in a 1981 law. The current proclamation strongly validates Israel’s intent to keep that land. The territory has ancient historical significance for the Jewish people. And it has also been strategically important for Israeli defense. The Golan Heights are an 1,860 square-kilometer high plateau formed of volcanic basalt at an average elevation of 1,000 meters, situated alongside the northeast corner of Israel. It is bordered by Mount Hermon in the north, the Roked River in the east, the Yarmouk River in the south, and the Jordan River with its Sea of Galilee in the west. That western feature, also known as the Kinneret lake and valley, is the lowest freshwater lake in the world, at over 200 meters below sea level. That lake is probably best known to western Christians as the Sea of Galilee in the New Testament Gospels. Into the Galilee flow the steep northern headwaters of the Jordan River, which then empty out of the lake to meander another 120 kilometers south toward the Dead Sea, a saltwater lake which is the lowest on Earth. To the north, from the eastern shores of the low-lying Sea of Galilee, a steep rock escarpment rises 500 meters up to the Golan Heights plateau. Jewish settlement in the Golan grew and thrived by the end of the Sixth and the beginning of the Fifth Centuries BCE with the return of the Jewish exiles from Babylon. The Jews flourished there as a stable presence over the next five centuries, until the First Century CE brought the Jewish rebellion against Rome. In that war in 67 CE, three years before the fall of Jerusalem to the Romans and the Roman destruction of the Jews’ Second Temple there, the Jews of the Golan fought the battle of Gamla. That valiant effort shaped the ethos of sanctifying sacrifice in service of defending the land. During that epic battle, a precursor similar to the one a few later in Masada, legend recounts that up to 9,000 Jewish warriors may have lost their lives. Forward to the same site exactly 1,900 years later. In 1967, Israel’s northeastern neighbor Syria, with armament from the Soviets, bombarded northern Israel from the Golan region. Those attacks, along with continuous attempts to divert precious water flowing to Israel from Mount Hermon, forced Israel to launch a preemptive strike, during the fifth day of the Six-Day War, in which they won over the Golan Heights from Syria. In 1973, amidst the Yom Kippur Holiday, Syria again attacked Israel. Israel fought back and held on to the Golan. The battle is documented as the largest tank battle in history, bigger than any WWII tank battle. It involved 4,000 tanks, pitting Soviet-made T-72s against U.S.-made Patton M60s. When Israel occupied the Golan from Syria in 1967, a few thousand Syrian Druze had remained behind. This community now numbers 27,000 people centered around four towns in the north of the Golan Heights. The Druze were offered, and most of them accepted, full Israeli citizenship. How lucky they are. Can you imagine their fate had they remained as part of what became today’s Syria, wracked by civil war and Islamic State’s jihad slaughter? The fact that the Druze have Israeli citizenship and full civil rights sets apart discussion about possession of the Golan, as a separate consideration from the one about Jewish settlement in Judea and Samaria. All Druze living in the Israeli Golan today enjoy the same rights as all Israeli citizens. They enjoy a life of coexistence and robust trade with their Jewish neighbors. Much of the background and military history here was provided by courtesy of my Golan correspondent, who served in the Israeli army in 1975. He was stationed in the Druze town of Mas’ada, at the foot of Mount Hermon—a majestic mountain and now home to Israel’s only ski resort. He describes the Golan Heights as an impressive steppe of rich volcanic earth now dotted with many Israeli towns and villages—an agricultural and industrial power base in the Israeli economy. 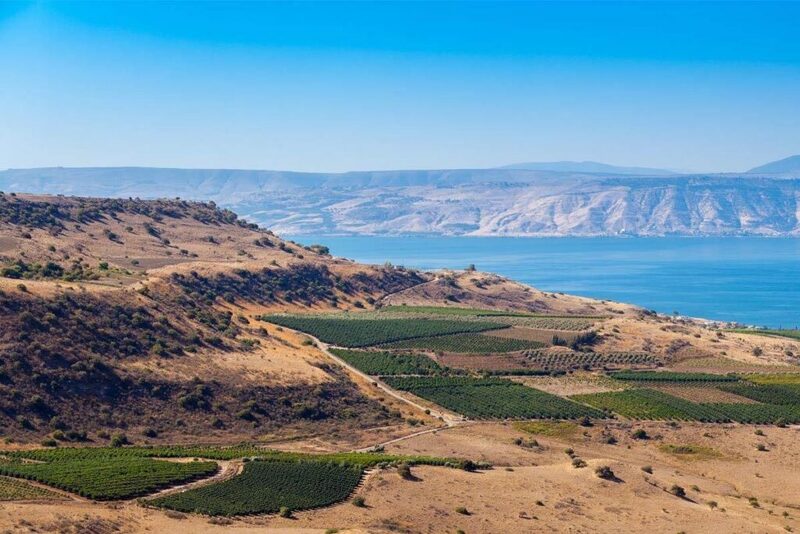 The spectacular view from the heights looks far down upon the Kinneret below, the Biblical Sea of Galilee, surrounded by towns cushioned in lush greenery and rich in prosperity. No longer will the valley be subjected to Syrian cannons firing with impunity. It has now been 52 years of calm since Israel took over the Golan Heights. And no one, not even Syria, expects Israel to give it up, even though there is still some world resistance to the move, particularly from the European Union. However, Israelis are widely grateful for President Trump’s act, by which the United States takes the lead in recognizing the Israeli people’s historical presence in the territory, both ancient and modern. The current proclamation is a strong validation of Israeli right to continued sovereignty over the Golan Heights. Trump’s recognition of the fact should remain as an ongoing alignment in Middle East policies.